The Overlooked Truth About Depression and Faith. Did I just hear that correctly? I sat gloomily, feeling the weight of the statement and sinking deeper into the pit that was my depression. I chewed on that statement for weeks, wondering if I wasn’t right with God. I debated in my own mind about whether my depression was sin, trying to decide if I had allowed my weakness to conquer me. The problem of depression and the Christian is complex, and I address it in this post because I am confident there are many who have asked themselves the same question. I have yet to find a verse in the Bible that reads, “Thou shalt not be depressed.” There is an abundance of verses that tell us to rejoice always and to count it joy when we are persecuted or fall into trial. Then, there is the book of Psalms, the book of Lamentations, the book of Job, the book of Ecclesiastes, the verses about being grieved by various trials, the verses about weeping enduring for a night and joy coming in the morning, verses that tell us to be firm and endure, and verses about going to the Lord for refuge. I pray that what I write here is helpful to anyone battling this problem. Depression can be split into two categories (although they often overlap and work together): there is depression caused by physical/chemical triggers and there is depression as a state of the mind. It may seem like splitting hairs, but it’s an important distinction. 1) The physical causes of depression. Mental processes are impalpable. Because we don’t see our mind working and processing (like a computer) there is a tendency to forget that a great deal of this intangible process comes from the tangible part of our body called “the brain” and is heavily influenced by our hormones. Our brain is a functioning organ like our heart, and as such is prone to malfunction. Dementia and Alzheimer’s are dysfunctions in the brain. These diseases afflict elderly Christians. Are they no longer right with God because their brain is malfunctioning? Over four years ago, a very dear friend of mine introduced me to the Weston A Price Foundation. Dr. Price was a dentist in the 1920s that was curious as to why so many of his patients had dental deformities. Fortunately for us, the man asked solid questions and did considerable hands-on research. He found isolated societies from different places in the world—Switzerland, Alaska, Africa, the Outer Hebrides etc.—whose inhabitants did not eat modern foods (i.e. white sugar, white flour, canned goods). Instead, they ate the foods available to them. Organ meats, fermented foods, fresh raw milk from grass-fed cows, fresh seasonal vegetables, bugs (in occasional places), fish oil, fat and grains that were sprouted or fermented. They did not suffer from tuberculosis (the disease of the day), their babies were round and happy, they had broad faces and—in spite of having no dentists—they often had perfectly straight teeth and little to no dental decay. They possessed a high level of optimism and had generally cheerful dispositions. As soon as roads were built that connected these societies to the modern world and the displacing foods were brought into those communities, the following generation of children were born with narrower facial structure and suffered dental deformities, tuberculosis and, yes, depression. Without getting overly technical, my understanding is that a narrower facial structure can affect the formation of the brain, which in turn affects the hypothalamus and the lymphatic system impacting hormone production and immune system function. It isn’t just a dental issue or a physical issue—it’s a mental issue. In effect, the way our parents ate when we were in the womb, affected our development in utero; the way we ate as babies and developing children affected our facial structure, which in turn impacted our brain development. In essence, the reason depression is so much higher today than 50 or 60 years ago can be traced to poor nutrition! Check out the comparative pictures in the book Nutrition and Physical Degeneration by Weston A Price. If you are suffering from clinical depression, it goes beyond a “state of mind” or “attitude.” It is highly likely that you may be dealing with a chemical or hormonal imbalance. If you were to be diagnosed with cancer, would that make you less of a Christian? Would God see you as a sinner because you suffer from a physical malady not brought on by conscious choice? Again, with Alzheimers and Dementia—are they less Christian than the elderly who still have full possession of their faculties? In John 9, Jesus and his disciples came upon a man who had been blind from birth. The blindness didn’t come because he was playing with matches and gunpowder. His parents didn’t beat him senseless or use illicit drugs that caused blindness. The man had been born with his blindness—a physical deformity. Have you ever stopped to consider that your physical battle with depression might be an opportunity for God to be glorified? I have read it, heard it and felt it implied that people who are depressed just need to “get over it” or “snap out of it.” For the Christian suffering from depression, being told that we should “get over it” and be paragons of joy can be even more discouraging because it amplifies existing feelings of inadequacy and weakness. Therefore I will boast all the more gladly of my weaknesses, so that the power of Christ may rest upon me. For the sake of Christ, then, I am content with weaknesses, insults, hardships, persecutions, and calamities. 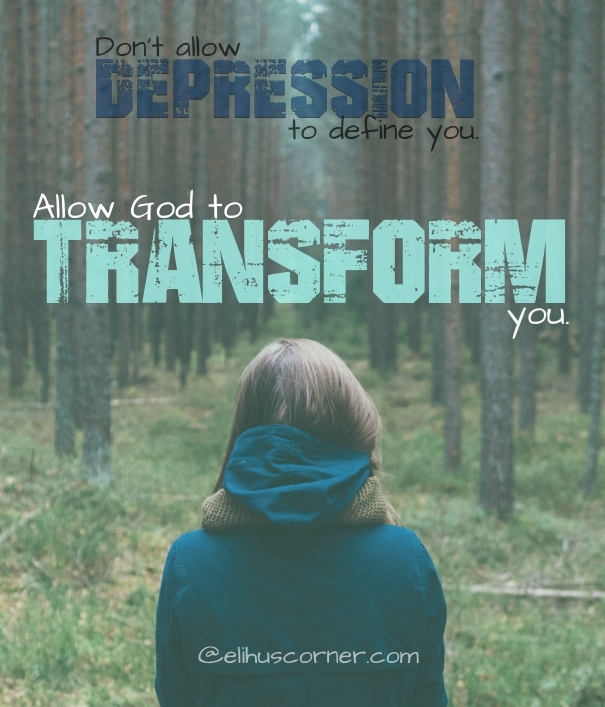 Look at your depression as an opportunity for God to manifest His strength. You may not feel like you can face the day. Your present circumstance and the way you feel at this moment may be so overwhelming you can barely get out of bed each day. Allow God to be your strength when you have none. Allow God to give you joy when you feel none. Allow God to lift you up when the burden feels too heavy. Do not allow your physical struggle with depression to define you. Allow God to transform you. If you live your life each and every day, fighting to find something to give thanks for, actively seeking for the good that can be found, working to heal the physical problems of depression and handing over the uncontrollable and overwhelming emotions to God when they rise up, just think what a difference that can make to your approach to life. If someone discovers that you are doing all that while battling depression, just imagine what a faith-building impact that can have! One person’s obedience + God’s power = Victory. A caution: Depression is no joke. It takes more than simply your own strength of will to overcome. Because it is a physical issue, there are steps that must be taken to deal with it. I personally do not advocate SSRIs, but that is a decision that you should make for yourself after doing research and consulting with trustworthy health professionals. Depression can lead to suicide, alcoholism and drug abuse. Do not hesitate to seek help. Furthermore, some lifestyle changes may be in order. Less sugar in the diet, lower carbohydrate intake, more magnesium and an increase in Vitamin D (just to name a few) are small changes that have been shown to counter depression in a big way. There is a character in the fiction of A.A. Milne (popularized by Disney) named Eeyore. Eeyore is a gloomy donkey who lives in the Hundred Acre Wood with Winnie the Pooh and friends. His voice always carries the “I’m down in the dumps” tone. On Eeyore’s Birthday, Pooh discovers that Eeyore is gloomier than usual, only to find out that it’s Eeyore’s birthday and nobody has remembered. Pooh looked–first to the right and then to the left. “Neither can I,” said Eeyore. Pooh is moved with pity and rounds up his friends to get presents for Eeyore. It all turns out well… it is a children’s story after all. But the fact is, Eeyore is always gloomy. Things could be going great and he would still find something to mope about. His outlook is pessimistic. Life holds little joy for him. His gloominess is caused by the way he has his mind set. Here is where I split the hairs. There are definite physical and chemical causes to depression, but there is also an attitude of depression. What I mean by that is some people have trained themselves (often unwittingly) to have a depressed outlook on life. They set their mind on the negative and sad. It isn’t a difficult task considering all the suffering around us. The clinically depressed often have greater trouble with this (this is where physical and attitude can run together) because they are already fighting the uncontrollable feelings brought on by the physical issues mentioned earlier. They have to fight harder than the average bear to set their mind firmly on good things. This is the critical point: they must fight. Often, they need help. They have to seek counseling, naturopathy, homeopathy and/or medication in order to reach that point where they can mentally choose to stamp on those negative emotions and feelings. It’s time we stop thinking like that. I’m not telling you simply to “get over it.” Believe me, that mindset does not help anybody. (It has certainly never done anything but make me feel worse!) What I am telling you is that you have to do something about it. Don’t wallow in it, look for a way out of it. We’ve been watching the old A-Team show lately. Yes, it’s a hokey show, but nearly always good for a laugh. In pretty much every episode, they find themselves in some nearly impossible situation and they have to engineer their way out. B.A. (played by Mr. T) ends up doing some welding, soldering or hammering, turning old jalopies into armored vehicles and barns into booby traps and inevitably they wriggle out of their danger with their cleverly devised solution. What most people see as junk and scrap, they see as potential tools for success. Think of the depression mindset as your nearly impossible situation. How can you engineer your way out? How can you look at this from a new angle? 1) For starters, who is on your side? Ok, I’ll give you a hint: The One who created the brain and body of the human being. How do you ask God to help you? By praying. Every time those feelings and thoughts rise up and threaten to immobilize you, ask God to help you overcome those feelings. Don’t let them have dominion over your mind. 2) What other tools do you have on hand? The Sword of the Spirit aka The Word of God aka the Bible! How often do you use that tool? If it’s just sitting in your toolbox collecting dust, it’s time to pull it out, dust it off and start using it. How are you supposed to get your mind off all the negative things in this life if you aren’t filling it with the positive? The Word of God can help us train our minds and hearts to discern what is rational and irrational in our thoughts and feelings. I have had days where, for no apparent circumstantial reason, I feel depressed, heavy, gloomy, and moody. I can actually recognize the irrationality of my feelings and I attack it vigorously. Again, this came with help and counseling. I tell my spouse, “I’m not feeling right, I feel heavy, I need you to bear with me and help me through it.” I pray minute by minute about it. I fight it. I dig deeply into God’s Word… especially the Psalms. It takes time to recognize the gloom for what it is, but it can be done. I also make sure I watch my food intake closely on those days, try to do some exercise if there’s time and intensely guard what I say. I am not always successful… I am human after all… but it has been an illuminating experience. I didn’t get to this point without a lot of assistance. I used counseling, acupuncture, homeopathy, dietary changes, exercise and healthy activity. It was gradual, but highly effective for me. Like anything in a Christian life, godly characteristics do not come naturally. They take training and practice. Trust takes training. Patience takes training. Joy comes with time and training. When dark, pessimistic thoughts come on, do you stew and brood about them? 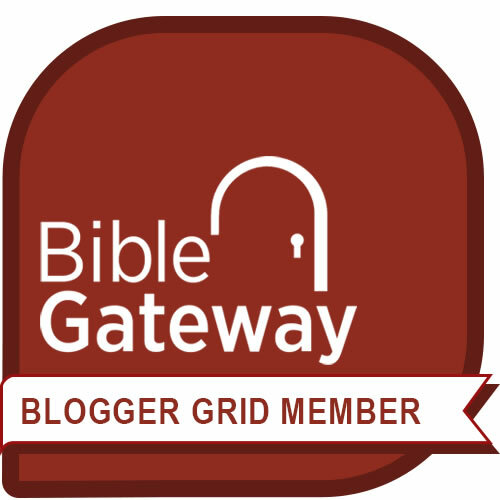 What does the Bible advise? You have to practice seeing the negative for what it is and then finding the positive and resting there. If you see something bad, ask yourself, how would God see this? Take for example the Supreme Court decision that has dismayed so many of us. Many of us feel some degree of dismay, righteous anger and fear. We fear coming persecution, imprisonment, job loss and other such things. What is a positive angle to this? How can we keep from being gloomy about the state of the Union? This World is not our permanent home. We long for a heavenly country. This incident is an excellent reminder that all that we see is temporal, not permanent. Thank you Lord for stirring my desire for heaven! There is an opportunity to talk to people about the Word of God. I know that most people don’t want to hear what we have to say, but we should be speaking anyway. I have been called stupid on more than one occasion, but it’s been an opportunity to stand up for the Word of God and demonstrate that a Christian can argue their faith lovingly and respectfully. 4) What other helps are available? Other Christians who have suffered from depression may have some invaluable insights on counselors or treatments that have helped them. Counselors (especially those with a Christian mindset) can be invaluable helpers. Do not brush aside counseling. So many people feel that they are too good for it. Don’t let your pride be your downfall. Get a counselor to help you train your mind and address the physical problems with depression if they exist. Don’t forget the websites and podcasts that I mentioned above. They could be very helpful for you. I will be attending the Weston A Price Conference in Anaheim this November and if you are interested in making dietary changes to help with depression or other illnesses, this may be the stop for you! Sally Fallon, the president, does an excellent presentation every year on the work of Dr. Price and it is illuminating! My very dear friends, do not allow someone’s misguided or uninformed statements plunge you into a deeper depression. The Lord knows our every weakness. Sometimes our depression is purely attitude, more often than not it’s physical, and even more often, it’s a combination of the two. If you are battling depression today, please know that there is hope and there are plenty of us who want to help! If you have overcome depression in the past or know of someone who has, please share that story to inspire hope for those who are feeling hopeless. Previous Post Coffee Chat 5 – What is your reason? Depression is part of the human condition. Of course, there are forms more serious than others, more debilitating. There are many root causes and I had to uncover nutritional, physical, and trauma as the roots of my depression. By treating the root causes, I’ve gotten much better and I know what to do to get myself out of depression when I slip back in. I went through all the stuff over some bad teachings in church on mental illnesses but people who say those things have never been there. The really hard questions require one-on-one time with the Father in order to get the answers that individuals need to rid themselves of depression. Thanks for posting this it is a subject that causes a lot of people needless suffering and actually, adds to depression when people say empty, hurtful, things. Thank you, Pam. I’ve been amazed to discover how many people have been hurt by poor comments in their churches. This is a conversation we need to be having in our congregations so that souls are not lost. This is a never-ending ending discussion, it seems. I remember hearing similar comments when I was a kid and my brother was diagnosed with severe depression. If he’d only get right with God, he’d be okay. That was the common response. Never mind that every day was an overwhelming challenge for him to get up and breathe, but he should surely have the energy and fortitude to dig into the Word and engage with others in study, right? I feel like this is less of a problem with the belief in depression as something real or not, and more of an issue with how we speak to and support one another within the brotherhood. “Oh, you have cancer? What can I do to help? You are exhausted? What can I do to help? You are broke and worried? What can I do to help? You are depressed? What can I do to help?” Because we are fallible people, what happens instead is accusations about poor choices and not relying on God enough. I can tell sometime until I’m blue in the face why depression and other mental illnesses are real, debilitating concern. For me, however, because I feel like I’ve kicked that horse for years, the current battle is reminding my brothers and sisters that we are just that. My husband did a talk on a Wednesday night recently about how we should talk to one another as Christians. He used Matthew 11:11 as a scripture reference. Why aren’t we treating one another as if the other is the greatest in the Kingdom? Even if someone believes that depression is a figment of the imagination, if we are truly concerned about our brothers, we should be trying to help them however we can, instead of writing it of as a personal spiritual condition. My brother begged God daily to help him overcome it. On his knees, in tears, he had a closer relationship with our Lord than many “healthy” Christians ever will. God gave us fellowship for many reasons. I believe healing is something we need to focus on more. Sorry for the rant. And sorry for the typos. Using my phone. Lorie, thank you for sharing the insight about your brother. It sounds like Your brother used his depression to draw near to the Lord, which is how the Lord desires us to address our struggles. I really like how you pointed out that we need to show care and concern for others, no matter what they’re going through. This can be difficult to do, and what I mean by that is this: it can be difficult to help with the right measure of wisdom and love. We should always approach our “help” to others with prayer and care. Yeah, you’d think at some point Mr. T would accept the inevitable! Lol. I love the A-Team.